For 2017, the Town has again contracted a professional company to set out traps, collect and test for WNV and should WNV be identified, larvicide and adulticide as necessary. Town staff will be actively looking for areas of mosquito breeding and treating those areas as necessary. Residents and businesses can help the Town by looking for area mentioned below and eliminating sources and habitat for mosquitoes. Town staff will also be working with other agencies on Zika related topics and preparedness. Since late May, 2017, when traps were first set, the results of trapping and testing mosquitoes in the Town have been NEGATIVE for the West Nile Virus. However, with communities around us finding and spraying for positive samples, we encourage you to continue to take precautions as noted below to reduce risks from mosquito bites. 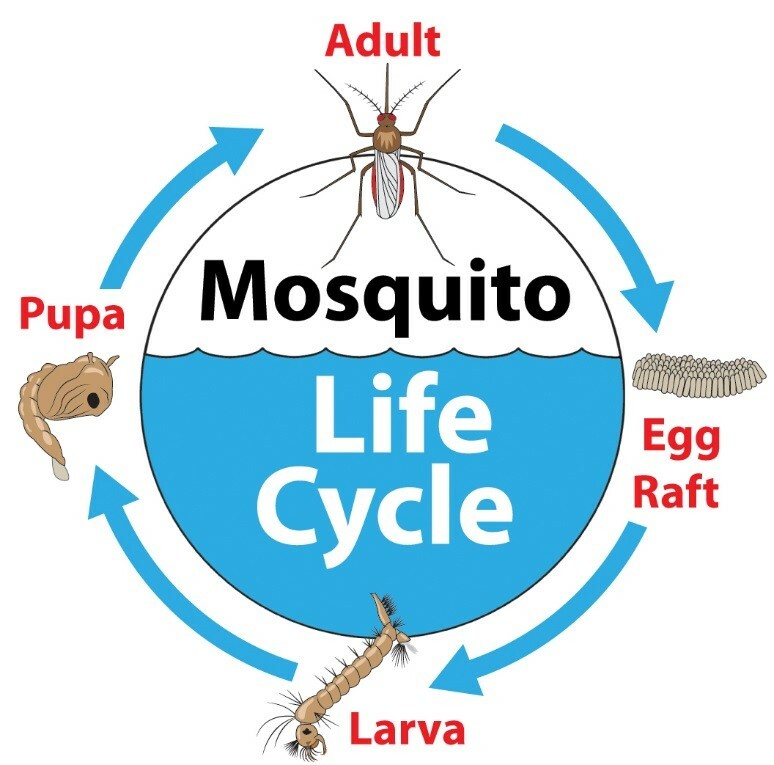 A mosquito can spend anywhere between 5-14 days developing from an egg, to larva, and pupa before emerging as an adult mosquito. Once they are adults, the males will feed on plant nectar and typically only living for a few days. Only females actually bite, as they need the blood meal for the proteins in order to make eggs. They can live for about a month, but their life cycle is very dependent on climate conditions. During the winter, females can over-winter in a hibernation type state in culverts, catch basins and similar areas. When temperatures begin to increase in the spring, they will become active and looking for meals and areas to lay eggs. As the summer heat sets in, their life cycle can actually speed up and development from egg to adult can remain closer to the quicker end of development. 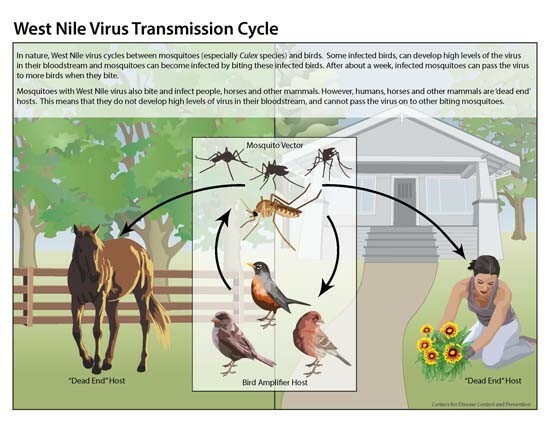 The graphic below explains the relationship between vectors (mosquitos), hosts (birds), and dead end hosts (Horses and humans) for WNV. Education is the primary and most important part of a successful IMM program. This is because personal bite avoidance as well as mosquito control are considered the only practical methods for protecting humans from West Nile virus (WNV) and other arboviruses that mosquitoes can transmit. The page includes the most up to date information from the Center for Disease Control (CDC) relating to current trends on mosquito activity in the USA and other countries as well as personal protection items. Travel warnings and info on repellents are available through the CDC. The Town of Prosper has also hired a 3rd party to trap and test mosquitoes for the presence of WNV. This information can be found above. The trapping results will be updated weekly once trapping begins for the year and as new results are received. Should the Town receive confirmation of the presence of WNV, dedicated Town staff will investigate the areas in proximity of the trapping location to locate and eliminate sources of larvae. The Town uses a microbial agent known as BTi (Bacillus thuringiensis israelensis) that produce toxins that are very specific on killing various species of mosquitoes with very little non-target species being affected. Pumps are used to drain areas of water when the BTi dunks cannot be used or in areas where applying larvicides is not advantageous. Should the Town receive consecutive positive mosquito samples, the Town’s contractor will be brought in to treat the area where the positive trap is located. This will be either by specifically targeting an area with backpack or UTV sprayers or with traditional truck mounted ULV spray rigs. The Town will only larvicide and/or adulticide an area based off of trapping resulting in positive tests for WNV. Should confirmation from Collin/Denton County Health Departments of a human case, traps will be rotated to the general area reported. Even with doing these activities, the Town still needs all our residents and businesses help. Areas around homes and around properties can have numerous areas that have the potential for mosquito breeding to take place. Keep window screens are in good condition and refresh water in bird baths and pet dishes every few days. These and other areas shown above can all prevent the ability for mosquitoes to live around your home. DEFEND Whenever you’re outside, use insect repellents that contain DEET or other effective repellents. DRESS Wear long, loose, and light-colored clothing outside. DRAIN As noted above, remove all areas of standing water around your home.